Crisis In Ukraine: Formation Of New Government Is Delayed : The Two-Way While the search continues for ousted President Viktor Yanukovych, officials are working to fill the posts left vacant after his removal from office. 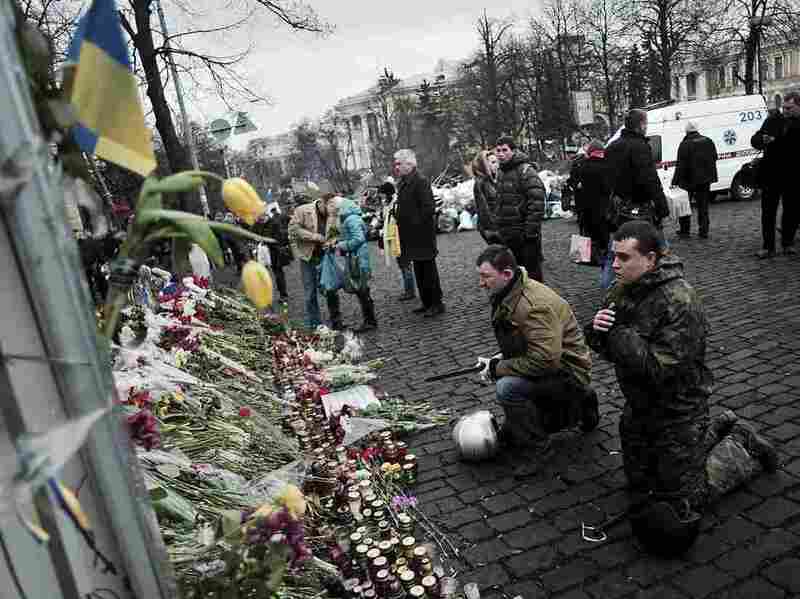 Praying For Those Who Died: Mourners were in Kiev's Independence Square again on Tuesday. It was the site of protests in recent months, and was where more than 80 people died last week in violence blamed on security forces. The search for ousted President Viktor Yanukovych continues in Ukraine, where months of protests over his turn toward Russia and away from the European Union, along with public anger over corruption, led to his removal from office on Saturday. As we've reported, the officials who are at least temporarily filling key offices now want to arrest Yanukovych and charge him with mass murder for the deaths of scores of protesters last week. Today, there's word from Parliament Speaker Oleksandr Turchinov, who is the nation's interim leader, "that a new government should be in place by Thursday, instead of Tuesday, as he had earlier indicated," The Associated Press says. It's also being reported that Andriy Klyuyev, who had been Yanukovych's head of administration, resigned from that post on Sunday and was later injured after returning to Kiev from Crimea, where Yanukovych may be hiding. Russia's InterFax news agency quotes Artyom Petrenko, Klyuyev's spokesman, as saying the former top aide's life is not in danger. The AP reports that Petrenko said Klyuyev had been wounded by gunfire. According to the AP, "Klyuyev was among the figures most despised by protesters in Ukraine's three-month political turmoil." -- "The European Union's foreign policy chief is promising strong international support for Ukraine as it works to form a new government," Voice of America writes. "Catherine Ashton spoke at a news conference Tuesday while visiting the Ukrainian capital of Kyiv. She said Western financial institutions are working on ways to help Ukraine's economy recover from three months of political protests. Ashton also urged Russia to let the nation find its own way forward out of its political crisis." -- Reuters writes about Volodymyr Parasiuk, "the lad from Lviv," who is now the "toast of Kiev" because his impassioned address to protesters Friday night may have been the deciding factor in pushing Yanukovych from office.